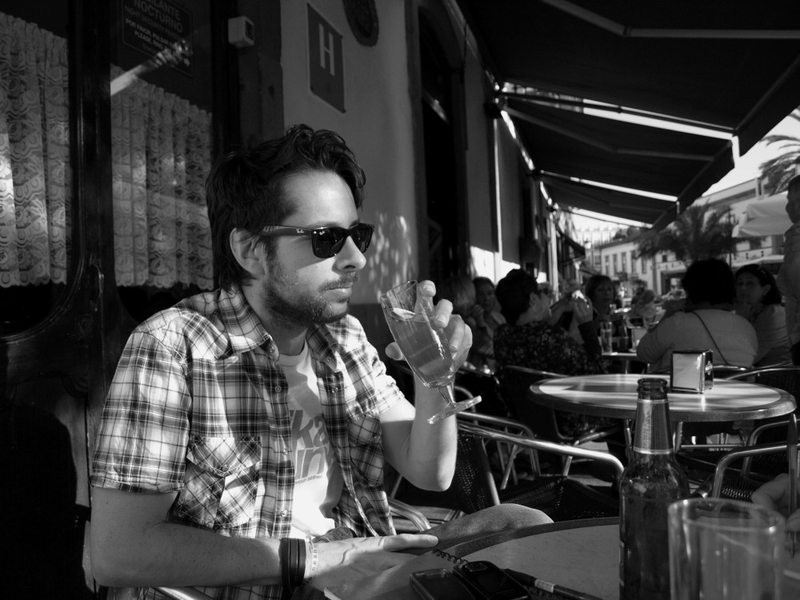 We’re sitting on the terrace of the Hotel Madrid in Gran Canaria’s amazing old quarter of Vegueta waiting to interview the founder member and lead guitarist of rising stars of the Spanish Indie rock scene, The Good Company; Víctor Ordóñez. “Do you think this could be him?” asks Jack. I turn around and see a slim thirty-something guy with a close cropped beard and designer shades strolling across the plaza, hands plunged deep into pockets. He’s practically got ‘Rock Star’ tattooed on his forehead. “Hi! Great to meet you!” says Víctor in a near perfect English accent, raising his shades and embracing me warmly. We’ve come to Gran Canaria for the day to interview Víctor and to explore the pulsating rhythm of Las Palmas, the city he was born and grew up in. Pounding the pavements of this bustling, lively capital, we discover a unique amalgamation of the old, the urban, the cool and the chic; it’s a city that blends tradition with innovation and fittingly, that’s exactly what The Good Company do with their music. I can see what he means. Listening to The Good Company’s first album ’28’, I’ve been playing ‘spot the influences’; overtones of U2 on A City Shines; echoes of Kaiser Chiefs in Busy Town; the Pink Floyd strains of Víctor’s guitar and Radiohead vocals of Sergio Pueyo in the haunting Endless, which ironically, I’ve found myself playing endlessly. But no individual sound emerges as the blueprint; all those flavours have been absorbed and fused into something fresh and original. In the heat of the late afternoon we move from the Hotel Madrid to the charismatic bar El Cuasquías where it feels like I should be carrying a guitar, or at very least someone’s amp before I can get in. Perched at the bar we order cold Tropical beers and Víctor tells us about the bands that play here and hints at some of the stories the walls could tell, no doubt set to their own Grammy Award winning soundtrack. We’re listening to the coolest sounds I’ve heard outside of my own living room since we moved to Tenerife 6 years ago; Indie rock, Jazz, R&B, Soul and Blues weave their rhythms around us making it increasingly difficult to consider the possibility of missing the last flight back to Tenerife as anything other than a minor inconvenience. Along with Víctor, fellow Gran Canarians Sergio Miró (drums) and Marco Valero (bass); and Barcelona born Sergio Pueyo (vocals) make up The Good Company. With reviews in the music press and on La Sexta TV consistently hailing them as a band to watch, these guys are rapidly making a name for themselves on the Spanish Indie Rock scene. They’re playing Dublin and Bristol right about now and they’ll be at The Forum in Barcelona on the 28th May 2010. Check them out on MySpace and Facebook. 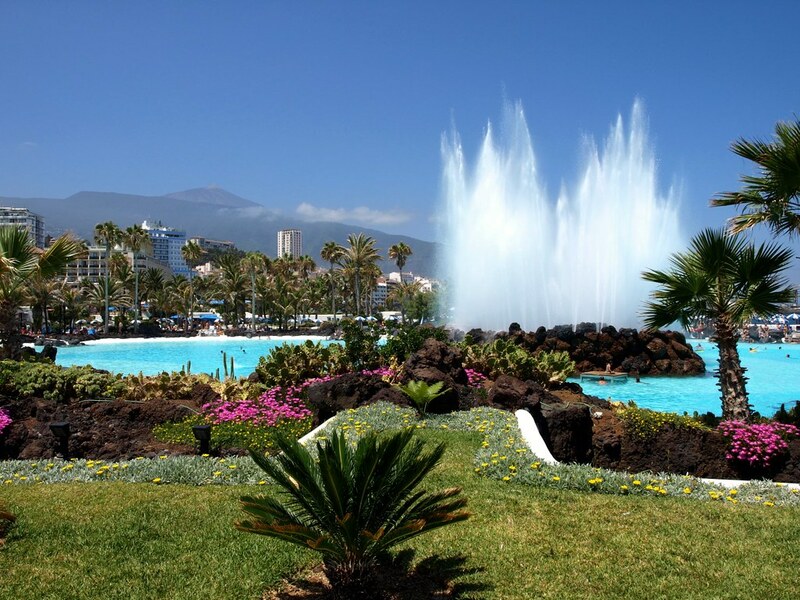 Tenerife Amable – what a difference a smile makes. A few years back Tenerife had a marketing campaign in which it promoted itself as “Tenerife Amable” (friendly Tenerife). Little stickers appeared on buses and taxis and posters popped up on motorway billboards and bus stops. For the most part since moving here I have generally found the Tenerife amable label to be justified and the vast majority of Tinerfeños to be very pleasant people. But every now and again, you experience something that stands out from the crowd and a couple of weeks ago, I found something that did just that. We’d arranged to spend an evening with Chris Clarkson and Alan Gilmour of tenerife.co.uk who were on a short business trip to the island from the UK. With dinner booked at the Watermelon in Los Cristianos and the prospect of a nice drop of vino, the option of driving back to Puerto de la Cruz was looking distinctly like a member of the Killjoy Club. So we booked a room at the Pearly Grey Ocean Club Resort in Callao Salvaje and arranged to share a taxi with John Beckley. 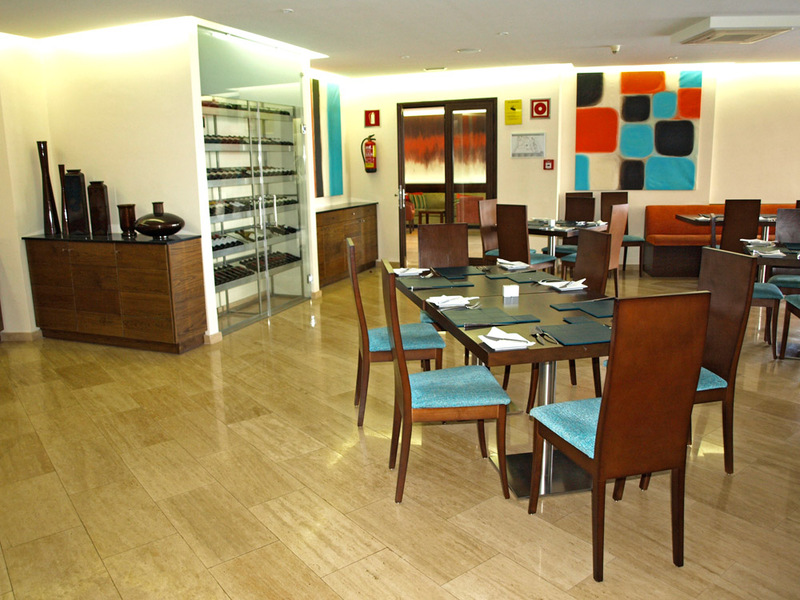 Having checked into our fabulous, ocean front room, we headed to Los Cristianos for a night of gastronomic and vinicultural delights served up with a healthy dose of lively conversation and good laughs. The night slipped away and it was near 2am when we arrived back at Pearly Grey. Finding the gate which led to our room locked, we went to reception but no-one was there so we popped our heads around the door of the bar/restaurant where we could hear voices chatting. “Is there anyone manning reception?” I asked. So we went back to reception and waited. A few minutes later the guy we’d spoken to in the bar emerged to lock up. And he led us off around the swimming pool area and down a ramp behind the main building emerging eventually outside what all three of us hoped was indeed our room. Laughing he said “ If this is your room, the name’s Paul. If it isn’t, I’ve never seen you before in my life!” And he disappeared back up the ramp. The next morning we went to the restaurant, ordered coffee from a smiling, friendly waitress behind the counter and sat at a patio table overlooking the pool while we took advantage of the free Wi-Fi zone to do some work. In the hour or so that we were there, there must have been 20 or 30 guests coming and going through the restaurant area and around the pool and every one of them was greeted and chatted to as if they were members of the family. Mums and dads stretched out on sun loungers while the kids used the Internet zone, or played table tennis and table football. The place had such a laid back, friendly and safe atmosphere that we felt as if we were guests at a huge house party where they just happened to have a beautiful swimming pool, uninterrupted ocean views and oodles of sunbathing terraces. Unfortunately, we had places to go and people to see, otherwise we would very happily have stayed there all day and probably booked another night. Last weekend, back in Puerto de la Cruz, we went to our local bar, The Beehive, to watch the Manchester United versus Blackburn match. We hadn’t even taken our seats or ordered our drinks when an elderly Brit sitting at the bar started aggressively verbally abusing the Man United club. We’re no strangers to Man Utd haters; jealousy is a very common trait (!) and we happily participate in friendly banter with rival club fans, but this man didn’t want to talk about football, he just continued to bellow his abuse throughout the first half of the game and quite frankly, made it quite unpleasant to be there. The contrast between our experience over that 24 hours couldn’t have been more marked. I guess the guy in The Beehive didn’t catch the “Tenerife Amable” campaign. When Chris Clarkson and Alan Gilmour of tenerife.co.uk came to visit from the UK last week, Jack and I jumped at the chance of spending an evening in the bright lights of Los Cristianos. 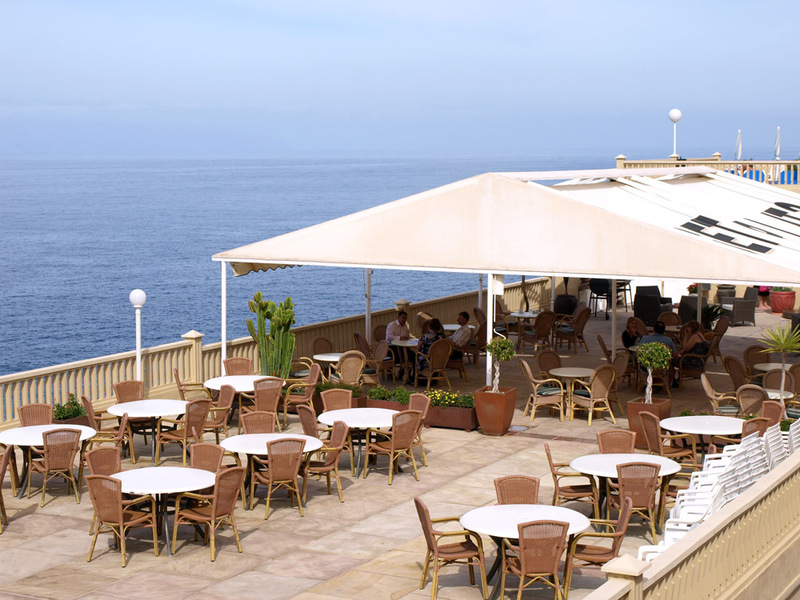 So we checked into The Pearly Grey Ocean Club Resort in Calleo Salvaje, joined John Beckley of Sorted Sites and headed to The Watermelon Tapas Bar/Restaurant in the chic San Telmo district of Los Cristianos. Although we were extremely impressed with the rather chic décor (frosted glass sheet water fountain, Gaudi-esque tiled mosaics on the walls and stone benches and sleek, silver and black furnishings) and the fabulous views from the terrace over Las Vistas beach and the sun setting behind La Gomera; we were less impressed with the food and the service. There was a good ten minute delay between the first two dishes arriving and the other three which meant that Jack and I either had to start eating before everyone else or Jack’s scrambled eggs with chistorras (Canarian sausage) and mushrooms was headed to the stone cold zone. My toasted bread with smoked salmon and tomatoes served with rocket and parmesan was beautifully presented but was bland and there was too much bread. The other specials when they arrived were kebabs served in foil parcels with fresh vegetables and everyone seemed to enjoy them but they lacked any real wow factor. The house red wine on the other hand was delicious and slipped down very easily. Postres proved to be a bit disappointing but that was more a case of confused recommendation rather than any fault with the food. Alan and I being chocolate lovers, I asked the waitress to recommend the chocoholic’s choice and after a great deal of chatting and an admittance that she didn’t particularly like chocolate herself, she told us to go for dish number one. When it arrived, dish number one turned out to be mainly ice cream with some chocolate shortcake slices. Alan and I waited for everyone else’s to arrive, convinced that this wasn’t the one we ordered but it took so long that our ice cream began to melt so we started eating. Dish number four when it finally arrived for everyone else turned out to be hot chocolate fudge cake covered in chocolate sauce and served with ice cream – d’oh! I didn’t see the bill but I wouldn’t mind betting it wasn’t cheap. The atmosphere was lively and the venue was unsurpassable but for me, the culinary offerings had a touch of the Emperor’s new clothes about them. Dinner over, we lingered over that delicious red before heading back towards the Arona Gran Hotel, where Chris and Alan were staying, and heading into Legend’s Snooker Club. While Tenerife Magazine took on Tenerife.co.uk on the pool table, Carol and I reminisced about our misspent youth in the clubs of Manchester and we all chilled out over some more drinks in the über-friendly atmosphere before Jack and I got a taxi back to our fabulous room in Pearly Grey. Puerto's more usual weather. If only it had been like this for Clive and Karen! At the end of last week I got one of those ‘out of the blue’ emails that occasionally wing their way to your in box. Someone I used to work with more than 20 years ago was coming out to Tenerife and was hoping to look us up. 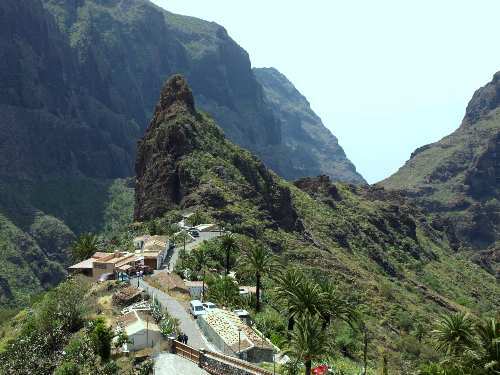 Clive and Karen are staying in Los Gigantes but they spent their honeymoon in Puerto de la Cruz 27 years ago and wanted to re-visit some of their haunts from all those years ago. I was really looking forward to seeing them on Saturday for a good old reminisce and catch up. To date, Puerto has always been kind to our family and friends, putting on her very best sunshine face for them. But not so this weekend. 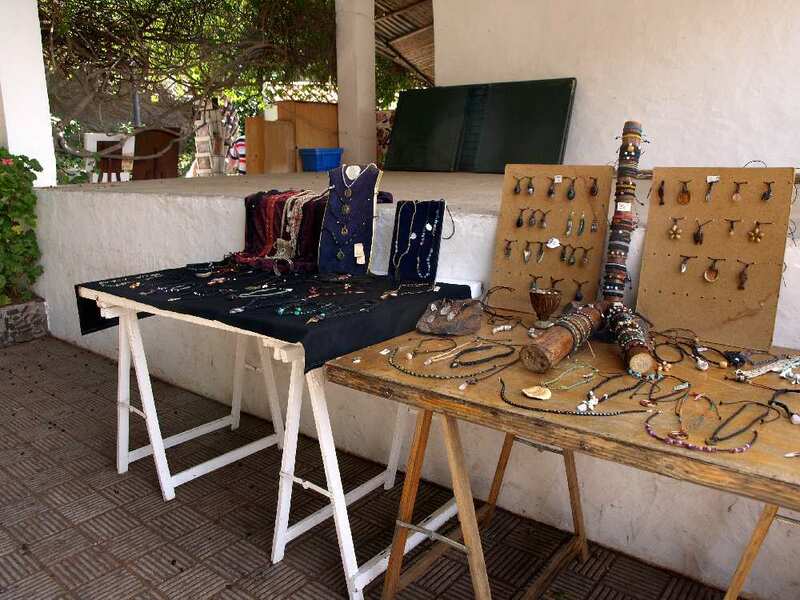 As we walked towards Plaza Charco, we spotted Clive and Karen sitting, shivering at one of the tables. I don’t think we’ve had a colder day this winter. It was dark, overcast and drizzling, in fact, it was very like Bank Holiday weather in the UK, except probably about 10 degrees C higher, not that Clive and Karen appreciated that as they were dressed for considerably hotter and sunnier weather. They’d had to buy a fleece and a wrap to keep themselves somewhere near warm. We spent a couple of hours in the Plaza bravely persevering with the cold lager before finally giving in and heading to the warmth of the Frigata bar on the harbour where we had enough time to get the feeling back into our fingers before Clive and Karen had to go for the bus back to Los G…and warmth. Today is even more horrible than yesterday. Although the sun has threatened to break through the cloud on several occasions, to date it has singularly failed to do so and we’ve had intermittent heavy showers. Great for the garden, rubbish for holiday makers. I feel very sorry for anyone who’s come out to Puerto for Easter and can only apologise on her behalf. 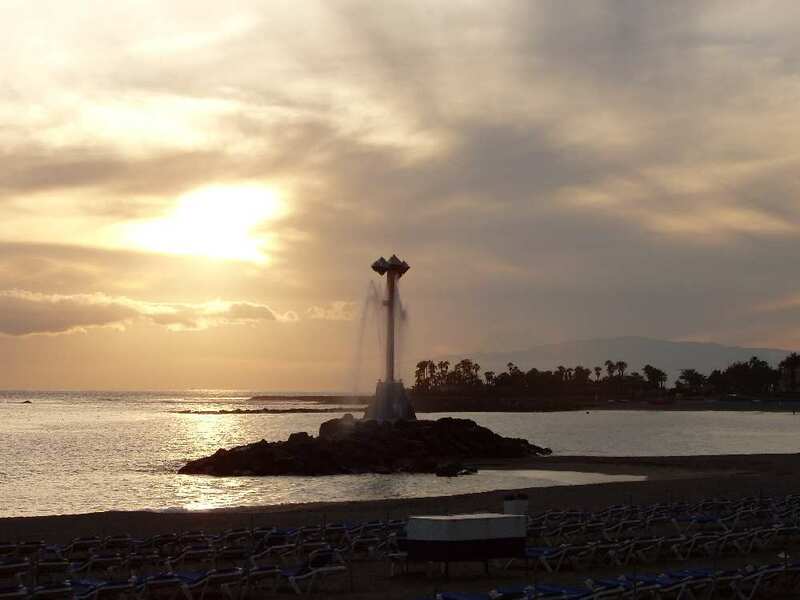 I just hope the rest of Tenerife is managing to put on a better show for Easter holidaymakers; although, looking at the webcams, I suspect only Clive and Karen in Los Gigantes are getting some proper sun. Looks like the east and west of the island wins out on the weather stakes again!